Why Does Microsoft Security Essentials seem to Interfere with System Restore? - Ask Leo! System restore just doesn't seem to work reliably. There is actually a much better way to protect your system from corruption and mistakes. Hi, Leo. I have 2 computers with the same problem: one is Windows XP Pro and the other is Windows XP Home. On both computers, System Restore fails as soon as there is a Microsoft Security Essentials restore point entry in System Restore. If I remove all restore points, System Restore works fine. I’ve tested it many times. As soon as MSE creates and updates a restore point, System Restore fails to restore again. Any ideas? In my experience answering questions here on Ask Leo! since the day System Restore was introduced, it’s been a source of many problems. You can think of these problems as hidden land mines. System Restore may appear to work. It may do something in the background, or it may silently fail. And you don’t really know until you need or want a restore point. Basically, as in your case, it just doesn’t seem to work when people expect it to. There’s also a common problem of people thinking of it as a backup, which of course it’s not at all. I do have an article that goes a little bit more deeply into my frustrations with System Restore: “Why I don’t like System Restore”. But my bottom line recommendation here is to stop relying on System Restore and instead rely on a good backup regimen that you put in place. There’s no way to know for certain what your issue is, since so many of System Restore’s operations are hidden from view. The one thing that I would look into, however, is the amount of disk space that’s currently actually allocated to System Restore. System Restore works with a fixed amount of disk space that’s allocated by the system and it saves “as many restore points” as it can into that disk space. 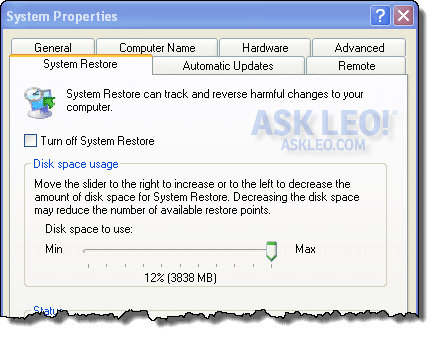 Often, the problem with missing restore points is nothing more than System Restore having used up all of that available space, and kicking out some of the restore points that it had, to make room for a more recent one. If possible, it’s worth trying to increase that allocation. Click on the System Restore tab. There you’ll see a slider that will allow you to adjust the amount of disk space that System Restore uses. I can’t say that it will make the problem go away. It may already be set to a maximum value, in which case there’s nothing more to be done. Ultimately, I don’t have a good answer to make System Restore work reliably. And of course, I’d rather you spend the time investigating a good backup solution to put in place. Why I Don’t Like System Restore - System Restore doesn't actually restore your system. Restore points you want often don't exist. System Restore has proven to me to be too unreliable to count on. Do I Need to Stop Using Microsoft Security Essentials? - Recently statements were made by a Microsoft spokesperson that some interpreted as implying that Microsoft was giving up on Microsoft Security Essentials. I went to the source and asked for clarification. « Previous post: Why am I not getting any email? I just have to agree with Leo that System Restore is best disabled and a good back up protocol adopted. Whenever I have tried to use System Restore it has failed to restore. I adopted Macrium Reflect instead and that has never let me down. Yes, it is more work than System Restore but what is the point in having an easy failure? Same here. I have a mix-and-match selection of four PC’s and a laptop, running Win 7 and the venerable XP. Never had 100% success with system restore. Usually it comes up with “Your computer cannot be restored to……. No changes have been made”, even in safe mode. I actually try it with the expectation that it WON’T work! I too, have had problems with system restore. It seemed to happen after MSE had scanned restore points and quarantined/deleted one or more of the restore files. The problem could be much more complicated but I haven’t had problems since changing some settings in MSE. It’s hard to argue against a fool-proof backup strategy, but most of us have merely a not-a-complete-fool backup strategy. Case in point is I use Macrium Reflect for an occasional full image. And my really current documents, password keepers, etc. are backed up on multiple systems and clouds. Despite these pretty-good safeguards, my Win 7 system was recently clobbered with an invalid windows and activation problem. As near as I can tell, the pop-up was legit and Windows Update would not work because the system believed it was a counterfeit copy of Windows. Seems the system had lost the Windows registration number within moments of a Microsoft Essentials update and installation of IE 11. So yeah, my big time backup strategies would have resolved things but guess what? I used system restore, went back a few days, restored and everything is swell again: clouds parted, birds sang, Windows registration number was back in place, and this time the two Updates went off without a hitch. So, Restore has a place in my gameplan, though there is no substitute for a real backup strategy. I hear good things about ERUNT, though I’ve never had cause to use it myself. Being old and semi computer illiterate System Restore is easy to use, and has saved my bacon several times. Problems seem to be caused by Microsoft updates to my windows 7.